Make no bones about it, this was one sloooooooow as molasses episode of Monstar. To have it be the penultimate episode makes it so frustrating as a viewer hoping for the best sort of uptick in tension and a convergence of all the story lines to set up for the finale next week. It’s like watching an exciting game only to have the player suddenly play at half tempo in the final minutes. But its still the same players so the moves are still there, and in this Monstar continues to remain true to its musical roots and youthful premise. 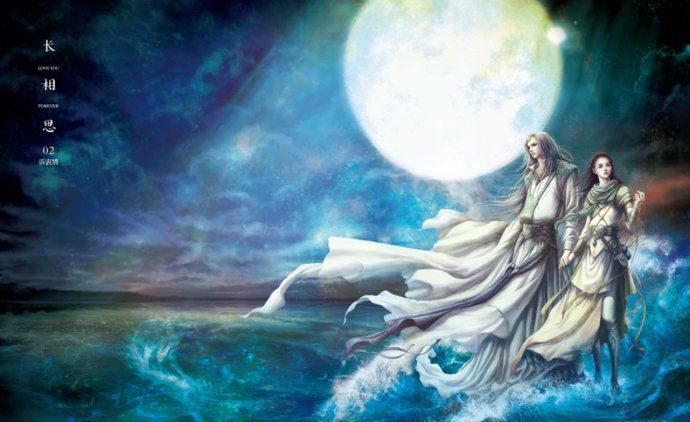 Issues aren’t going to all be resolved, and whatever resolution that comes may feel unsatisfactory or messy. But that’s life and there aren’t any easy fixes, but sometimes it feels good just to get it off the chest and move on to more productive things. This episode may be slow but it did reveal the big misunderstanding between Seol Chan and Sun Woo (a breach of trust, totally what I expected), and a bit more color on the issues that drove a wedge between Se Yi’s parents and later on what caused Ji Woong to go from a successful music producer to a recluse. Nothing was surprising but it also didn’t feel like such a big deal. It seems like a big for the person dealing with it, but once revealed it becomes something that logically can be worked through. And it can all happen off-screen for all I care, I just want some definitive movement on my OTP ship and it was frustrating to see Sun Woo still clinging to a hope with Se Yi at this stage. It’s like the ship left the dock and he’s still thinking maybe he can pilot a little rubber craft and catch up. Move on and lick your wounds, Sun Woo. I was thrilled that Se Yi finally told him directly that she likes Seol Chan, and Seol Chan actually dug deep inside and admitted he once shared a meaningful friendship with Sun Woo and it wasn’t something he could ignore even if they are not friends anymore. If I overlook the narrative limitations of this drama’s wrap up, I find the musical elements still masterfully integrated and a great way to patch over what isn’t there. Next week’s finale goes back to the big musical showdown that ought to amp up the energy once again, and I’ve seen pictures floating around of some cast members with decidedly different looks which confirms that logically we’ll see a time jump at the end. I’m still totally excited about the ending even if Monstar didn’t quite achieve all the potential it showed at the start. What worked was so satisfying and what was missing ultimately doesn’t ruin the delicious dish that was created. Se Yi is in the basement music studio talking with Ji Woong as they observe the now-blooming flowers. Se Yi reveals her mom’s return to Korea but lately she’s been too preoccupied with other things to deal with her mom. Ji Woong figures it’s because of Seol Chan, which leads Se Yi to wonder whether her mom felt the same way about her dad, and if she did then how and when did it all go wrong between them? Se Yi wishes she never overheard her mom talking with her uncle. Eun Ha arrives with Do Nam and Kyu Dong and they start making music. 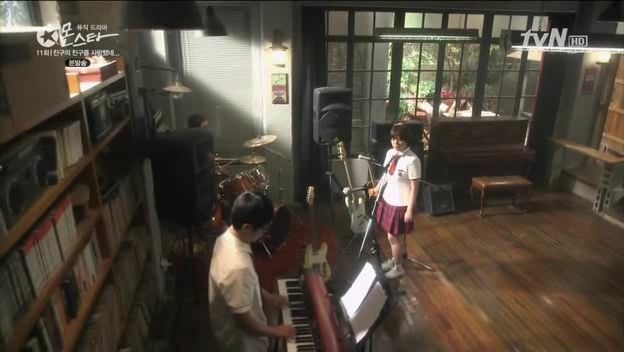 Do Nam’s not bad on the drums and Kyo Dong’s piano playing has improved tremendously. Eun Ha knows about an upcoming music competition and brings up how awesome they were last time. Do Nam is now embracing his musical roots and seems keen on the idea. Se Yi joints them and offers the group some cake and they all sit down to chill. Remembering how Se Yi said that she wished she could take it back, Ji Woong stands outside the basement stairs and thinks back to the night of the accident that changed his life. He had given a ride to a young girl who couldn’t get a taxi. He did so because Se Yi’s mom was standing there and he purposely did it to hurt her. He wishes he never did that. Sun Woo arrives at the house and Ji Woong uses the chance to ask him where to find the Thai street singer Nawin. While Eun Ha, Kyu Dong, and Do Nam are playing music inside, Se Yi and Sun Woo sit in the courtyard studying for the exam. The music reaches them and both smile and start to sing. It’s a lovely moment where their voices waft in to mix with the music coming from inside. Se Yi reveals to Sun Woo that Ji Woong gave her a key to the house so they can come when they want going forward. Sun Woo is pretty happy with that. 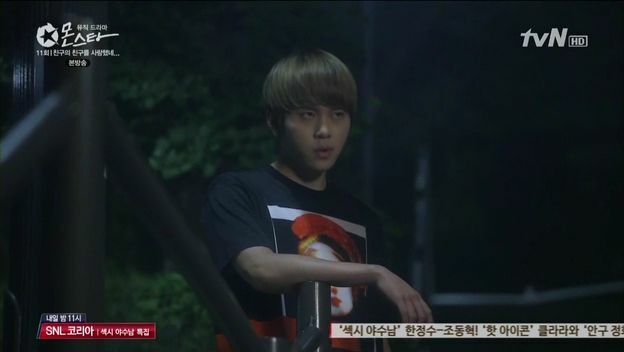 Manager Hong drives Seol Chan to the basement studio and even he’s wondering why Seol Chan is going here? Seol Chan knows but he can’t help himself, and it’s even more bothersome as he’s remembering how little Sun Woo was waiting for little Se Yi that Christmas eve out in the cold. 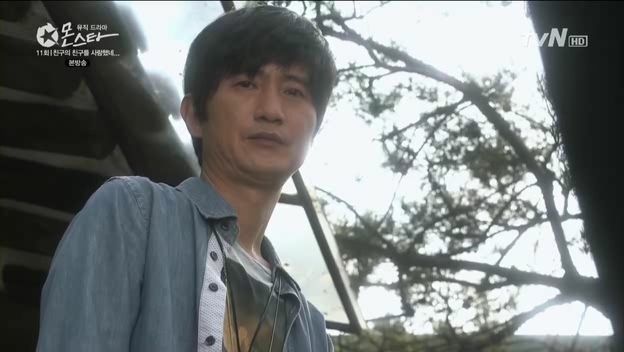 When they arrive at the house, Ji Woong walks out and Manager Hong once again gets a good look at his face. Seol Chan talks with Ji Woong and asks if he can play the guitar. Ji Woong can and Seol Chan grumbles again about Se Yi thinking guitar playing guys are cool. Seol Chan asks Ji Woong to teach him but Ji Woong isn’t so easy to win over. Eun Ha walks out looking for Na Na, who walks up right at that moment. Eun Ha and Na Na goes in, and Eun Ha casually ignores Seol Chan’s greeting and tells him to close the front door on his way in. Seol Chan and Na Na walk into the basement and both Kyu Dong and Da Nam kinda look sheepish when they see her. I don’t blame them, she’s pretty cool. Seol Chan smiles when he sees Se Yi walk in from the courtyard but then his smile freezes when Sun Woo walks in behind her. Sun Woo asks why Seol Chan is here, and as Seol Chan is stammering for an answer, Eun Ha interjects and asks Seol Chan all sorts of questions about his Man in Black hoobae Arnold. Looks like Eun Ha has a new star to idolize. Everyone looks around awkwardly until Do Nam loudly plays the drums to break up the mood. Seol Chan follows Sun Woo up the stairs as he takes out his phone. Seol Chan confirms Sun Woo is calling his mom like he always does to check in so she doesn’t worry. He seems to want to say something but doesn’t and goes back downstairs. Seol Chan tells the rest of the group that he’s taking off but Eun Ha asks him to sing otherwise why did he come? Good point. Even Kyu Dong and Do Nam asks him to sing when they play a song. Seol Chan agrees since they are all friends. When Seol Chan asks what song they want him to sing, Eun Ha says “I fell in love with a friend’s friend”. A round of awkward glances circulate between Seol Chan, Sun Woo, Na Na, and Se Yi. Seol Chan tries to beg off by saying he doesn’t know this song but his former super fan Eun Ha knows the exact time and date he sang it before in concert. Got you right there, dude. Do Nam turns to look at Na Na. Eun Ha smirks, she clearly know what she’s doing and my gut tells me she’s trying to solve this love triangle for the participants and force them to confront it outright. Kyu Dong is happy and starts to play, and Do Nam and Eun Ha join in. The music starts but Seol Chan doesn’t move towards the mic. Eun Ha asks if he is disdainful of singing with them? 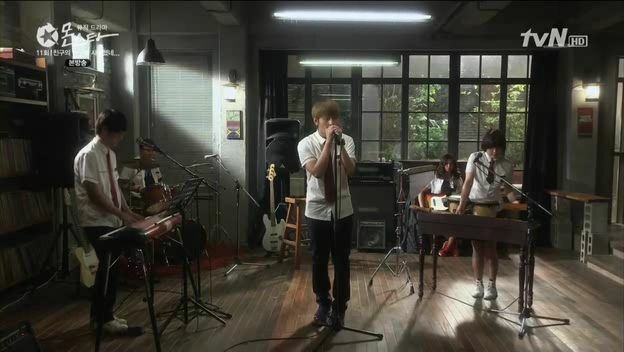 Seol Chan walks to the mic and starts to sing this ballad about how he fell in love with the friend of his friend. Everyone looks awkwardly at each other. Seol Chan’s singing continues as the scene cuts to everyone deep in thought – Seol Chan as he’s being driven home, Na Na walking home, Se Yi walking home, Sun Woo sitting alone in the studio, Ji Woong going to look for Nawin, and Se Yi’s mom standing outside the apartment. 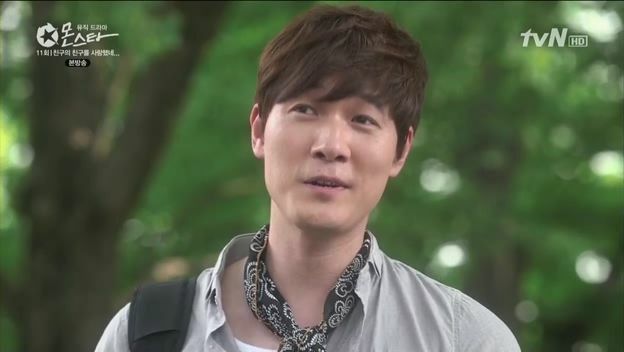 Seol Chan is told by his agency that he has to perform a duet with his former co-star Ari. He doesn’t want to do it but is told this is great for his career rehab. Se Yi is on the phone with Eun Ha as she walks home, and Eun Ha is matter-of-factly ripping all her Seol Chan posters and pictures off her wall and replacing it with Arnold’s. Glad that she recovers so quickly. Eun Ha encourages Se Yi to go for Sun Woo, he’s the better pick and likes Se Yi more. Se Yi ends the call when her mom comes out to get her. She asks her mom why she did it, and then walks away before her mom can answer. Sun Woo sits alone in the studio and then grabs a guitar and starts to play and sing a song. He totally has the same coping mechanism as Se Yi. He finishes playing and Na Na walks in. They sit down and he grabs the guitar to continue their lessons. Sun Woo is talking about how difficult it is to learn the guitar but Na Na says she can tell how difficult it is for him to deal with having a first love taken away. Sun Woo acts like he’s fine and doesn’t want to talk about it. Na Na calls him on this immature way of dealing with a tough situation. Na Na takes the guitar from him and takes out her cell phone to play a background riff. She then starts to play the guitar like a seasoned pro and it totally catches Sun Woo off guard. When she’s done, he asks why she pretended not to know how to play. Na Na explains that she learned from the ahjusshi at her dad’s room salon since that was her entire social circle growing up. The class finishes taking their exams and Seol Chan jokes with Se Yi about whether she’ll get last place. Eun Ha comes over and says that two guys in class like Se Yi, and since one of them has been in last place this entire time, they are hoping she’ll take over. Eun Ha cackles and walks away, leaving Seol Chan flabbergasted at how Eun Ha has changed. The nosy PD arrives at school with his assistant to scout for an upcoming singing competition show on the network. The assistant doesn’t think Seol Chan will participate but the PD is confident he can get someone at this school to change Seol Chan’s mind. Soel Chan walks out with Eun Ha, Kyu Dong, and Do Nam. She keeps talking about Arnold and he asks how she changed so fast. 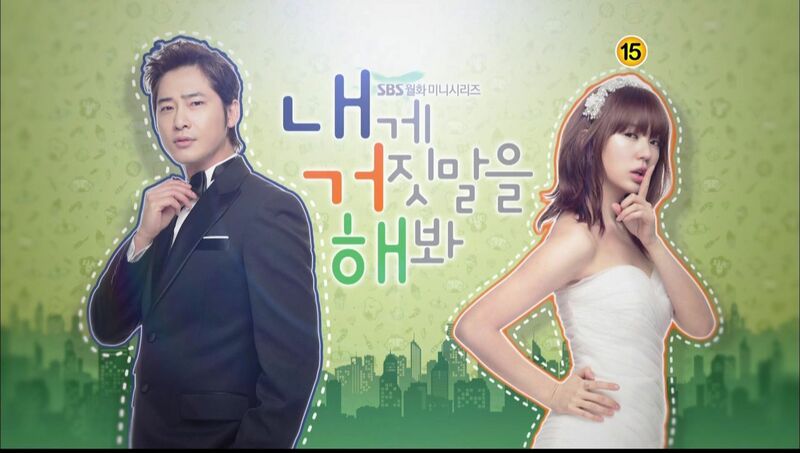 Eun Ha smirks and says love changes. Na Na walks by and Eun Ha asks her to join them to go practice. Kyu Dong blushes and also asks her to come. Eun Ha makes a dig at how busy at Star like Seol Chan is to hang with them. Eun Ha wonders where Se Yi is? Se Yi is running up the stairs and runs into Joon Hee. He stops and smiles, calling her full name and asking how she did on the exam? Se Yi calls him School President but he reminds her that she knows his name. Se Yi has friends waiting so she moves past him but he stops her again. Joon Hee is pissed she’s not calling him by his name but Se Yi points out that calling someone by their name means wanting to be friends. But Joon Hee doesn’t want to be friends with her, isn’t that right? So why bother? Joon Hee glares at Se Yi and I’m sensing serious chemistry fueled anger there. Sun Woo walks by and interjects himself between Se Yi and Joon Hee. He asks what Joon Hee wants and the two guys glare at each other. Sun Woo and Se Yi head back to class where she grabs her bags. She was running earlier because she left her bags and Sun Woo wonders why she’s been so absentminded lately? He gets a call from the sick little girl Hae Rim who wants to see them. He tells Se Yi that it’s Hae Rim’s birthday today and she wants to see them. The others are still waiting outside for Se Yi and Eun Ha teases that Se Yi’s legs are too short. Hyo Rin and Jae Rok walk up to them and Hyo Rin demands Eun Ha hand over that journal she kept called S&S’s secret love story. She starts to say that the story was about Seol Chan and that crazy girl when Eun Ha rushes forward and slaps her hand over Hyo Rin’s mouth to shut her up. Hyo Rin pushes Eun Ha off forcefully and then scrubs her mouth saying Eun Ha’s touch dirtied her. The other kids are upset and chastise Hyo Rin, who starts to spit and claims she needs water to clean herself. Even Jae Rok is taken aback by her horrible behavior. Hyo Rin starts calling them losers and beggars and finally even Kyu Dong and Seol Chan get angry. Suddenly Joon Hee arrives and Hyo Rin turns to her oppa for support. The PD and his assistant sees this confrontation and is pretty curious. Seol Chan tells Joon Hee that he needs to teach his younger sister some manners when speaking with her elders. Joon Hee walks away and Hyo Rin scurries after him. Sun Woo and Se Yi finally join the group having missed all the action earlier. Sun Woo gets another call from Hae Rim and he asks S e Yi to come with him to see her. Seol Chan hears this conversation and storms off. The PD stops Joon Hee and asks if All for One is interested in another duel with Color Bar. Hyo Rin scoffs that they already won but the PD points out that public sentiment doesn’t think that way. Joon Hee isn’t that easy to manipulate and walks away, but stops when the PD points out that he gets another opportunity to thoroughly put Color Bar in its place. That interests Joon Hee. Seol Chan and Manager Hong drive past the PD talking with Joon Hee’s group. Seol Chan asks to go to the basement studio since rehearsal doesn’t start yet. 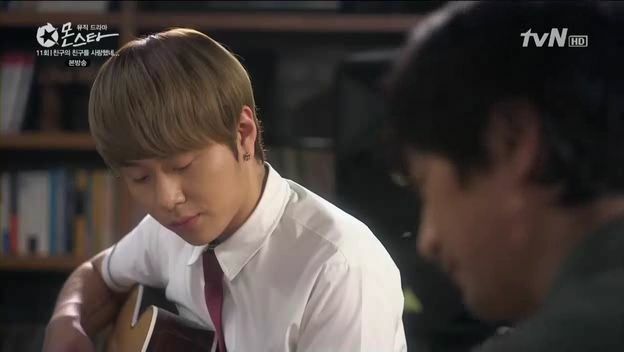 Ji Woong is teaching Seol Chan the guitar and can see that Seol Chan is a quick learner. Seol Chan brings up that he’s a Star and Ji Woong asks if being a Star isn’t hard. Seol Chan says no, people are happy he’s born to be a Star. Manager Hong finally puts face to name and remembers who Ji Woong is, a famous music PD and composer. He finds his picture and confirms that its Ji Woong. 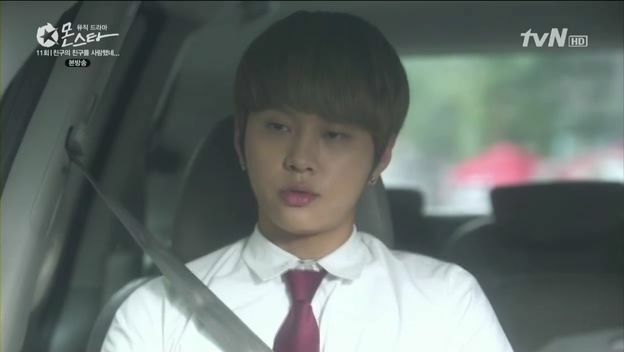 As Manager Hong drives Seol Chan to rehearsal, he tells a shocked Seol Chan who Ji Woong really is. He explains that Ji Woong disappeared after an accident and scandal years ago. It was Christmas Eve and Ji Woong was leaving with his colleagues after winning another award. Se Yi’s mom was outside waiting for him. He ended up driving too fast in his car while the teen girl he gave a ride to slept in the passenger seat. There was an accident and she died. Ji Woong was blamed for giving a ride to an underage girl and causing her death. So he left the music world. 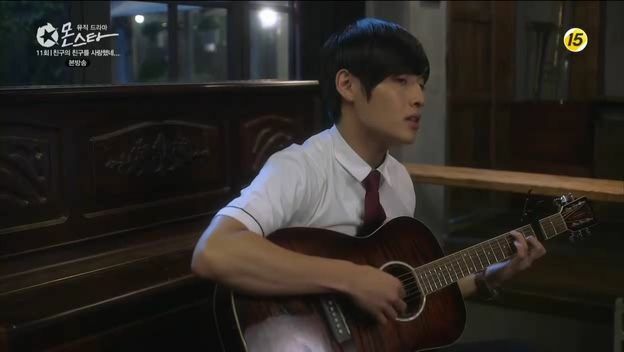 Ji Woong plays the guitar in the courtyard. Sun Woo gives Se Yi a ride and he looks at her while she looks outside lost in her own thoughts. Se Yi’s mom sits in Se Yi’s room and touches the mommy/child sheep stuffed animals. Seol Chan goes home and stands in the huge empty condo. 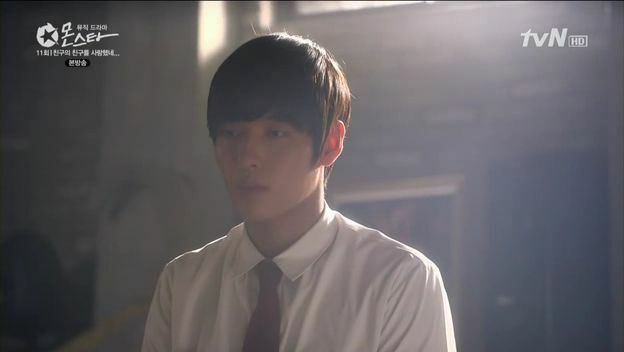 Seol Chan sits down in his room and thinks about Ji Woong’s story. He looks at a family portrait and next to it is the sheep Se Yi returned to him. He takes out his phone and contemplates calling but doesn’t. Se Yi and Sun Woo are outside the hospital with Hae Rim who is rocking a wig that is totally a copy of Se Yi’s hair. She asks if she’s prettier than Se Yi. Sun Woo compliments her on being so pretty even when she’s grown into a grandma. Se Yi hands her a birthday present but refuses to humor her as being pretty since she’s just a little kid. It’s a joke but causes Hae Rim to cry and Sun Woo has to comfort her. Sun Woo and Se Yi walk home and she teases that he needs to marry Hae Rim when she grows up since she clearly adores him. Sun Woo reveals that he had a little sister once, but she died. He adored her and she followed him everywhere. After she died, his mom was devastated and become extra protective of Sun Woo. 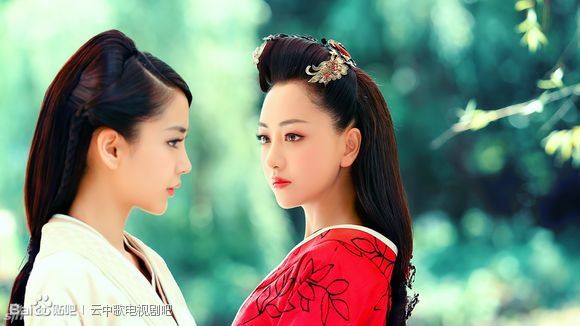 When he met Se Yi, she reminded him of his little sister. He tries to be strong because even though this is hard on him, it’s even harder on his mom. Se Yi realizes that is why Sun Woo calls him mom all the time and is fine with having a driver. Sun Woo drops Se Yi off at home and Seol Chan watches from the distance, confirming that Se Yi did go with Sun Woo today. He wonders what they did this entire time? Se Yi sits in her room and hears her dad singing and remembers what Sun Woo said about having a hard time with loss. She sees the mommy/child sheep and goes out to the living room to help her mom fold laundry. Se Yi finally talks to her mom and asks if her mom betrayed her dad because Se Yi stole all the love from her dad? 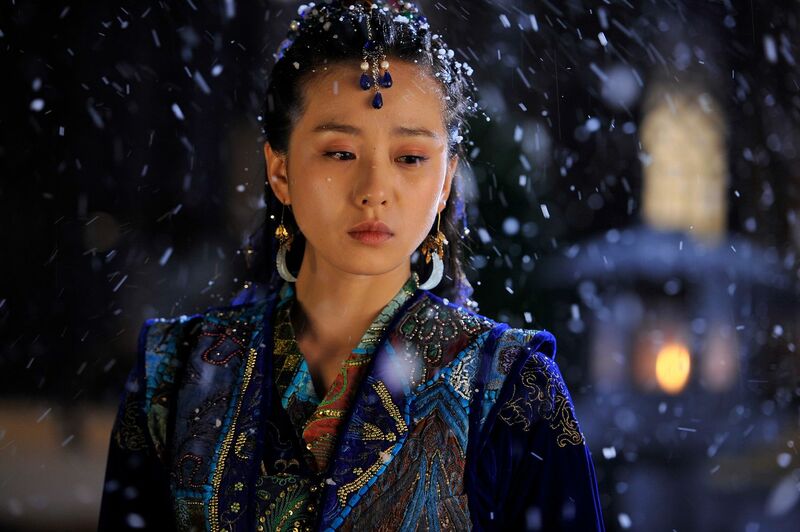 Se Yi wonders if she’s the cause for everything that happened. Se Yi’s mom tells her no, Se Yi had nothing to do with it. Se Yi’s mom goes outside and hears her husband beside her. He sings for her knowing she’s still suffering. Se Yi’s mom says she is still angry at him, angry for all the things he did that hurt her, like cheating on her when they dated. Se Yi’s mom says sorry to her dad and he says likewise. Se Yi’s mom is sobbing and Se Yi walks out and sees it. 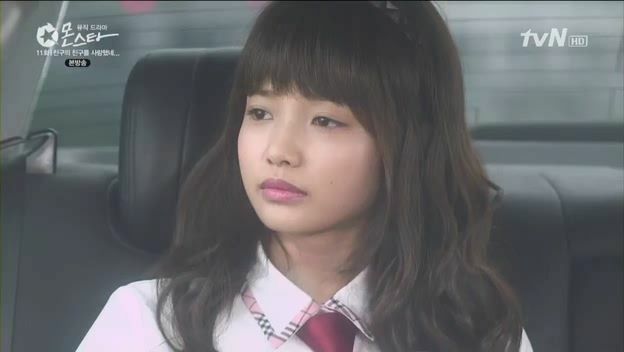 Seol Chan sees Se Yi at school and asks her where she went yesterday? Se Yi explains she was with Sun Woo to see a girl named Hae Rim that Sun Woo knows. Seol Chan is upset she would be with Sun Woo and go see someone together. Teacher Dokko talks with the Principal about an upcoming singing competition. Joon Hee is in the office and overhears it, too. The kids gossip about it and wonders who would be sent from their school. They stare at Jae Rok and think about All for One, and look at all the empty desks where Color Bar members sit. Color Bar sit with Teacher Dokko who explains about this event. Some look excited but Seol Chan looks upset and Sun Woo sees it. Color Bar is back in the empty classroom and Eun Ha is thrilled about this opportunity and how they can have a professional band now with all the instruments. But Seol Chan is the first to say he can’t do it. He has a professional career and can’t do these amateur events. He calmly apologizes and leaves. 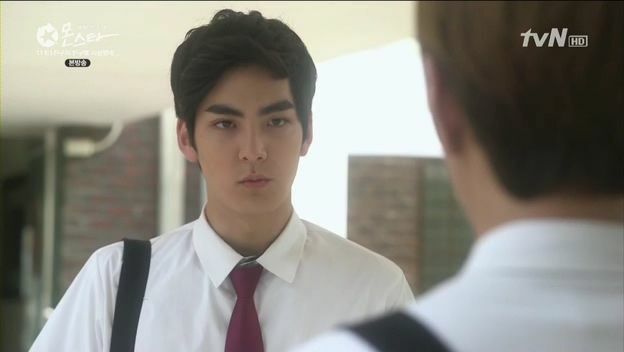 Se Yi runs after him and apologizes for the rest of the group who didn’t understand his situation. Seol Chan tells her not to worry. He looks up and Sun Woo is standing off to the side looking at them. Seol Chan asks Se Yi if the performance is the only thing she’s worried about? Doesn’t she know what the biggest concern around them is? 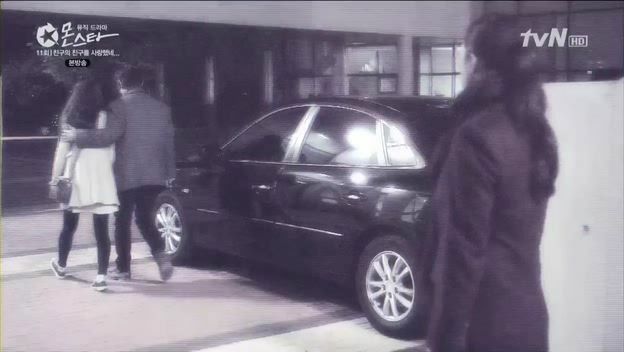 Se Yi follows his eyes to where Sun Woo is walking away. Seol Chan says he’s got other things on his mind and then leaves. Eun Ha walks with Kyu Dong and Do Nam and wonder if they can do it without Seol Chan as long as they have Sun Woo. 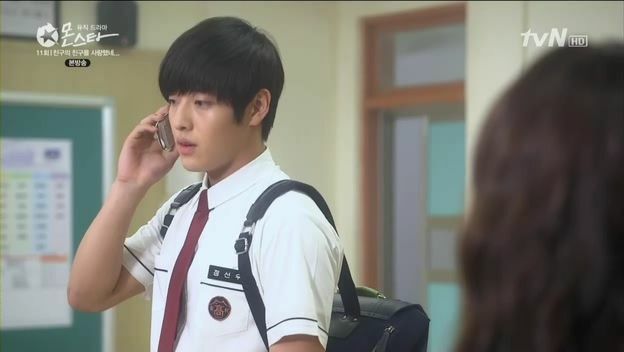 Seol Chan gets a call from Sun Woo to come out to meet. Seol Chan thinks Sun Woo wants to talk about the performance he can’t do, but Sun Woo isn’t interested in that and wants to know why Seol Chan has been so shifty and awkward around him lately? Did Seol Chan do something he feels sorry about? Seol Chan stammers that he has nothing to be sorry about. Sun Woo is good with that, because he’s not given up yet and he’s not done. Sun Woo gets a text from Na Na for their 7th date. They meet at a sporting goods store and she has him try on a shirt. He thinks it’s for him and suggests he make it herself instead, but its not for him. As Na Na and Sun Woo walk outside, Na Na confirms that his hanging out coupon offer doesn’t have an expiry date. She asks about his situation and Sun Woo says he’s going to keep going to become what Se Yi wants. Na Na yells at him with tears in his eyes about being so clueless which is why he will always keep losing to Yoon Seol Chan. Na Na turns and runs off. A few Color Bar members are in the studio practicing. Se Yi is totally off in her own world thinking about what Seol Chan said to her, what the biggest on his mind is lately. Do Nam can tell and bangs the drums loudly to try and get everyone focused. Kyu Dong calls an end to practice today and takes off for the PC bang with Do Nam. Eun Ha and Se Yi are at the playground talking about Sun Woo and Seol Chan. Eun Ha still suggests Se Yi pick Sun Woo and wants to know who the girl was that Sun Woo and Se Yi went to see yesterday since clearly that is bugging Seol Chan. Seol Chan is at the agency music room and thinks back to his conversation with Sun Woo. He gets a call from Se Yi that he doesn’t answer. Manager Hong shows him the latest MiB picture and Seol Chan can tell it doesn’t look great and only Arnold looks good. Se Yi tells Eun Ha that Seol Chan didn’t answer because he was at practice. Seol Chan takes out his phone and appears to want to call Se Yi but when Manager Hong walks in then he puts it away. Se Yi walks home and sees Seol Chan waiting for her outside. Seol Chan and Se Yi sit down at a bench and he calmly tells her that he knows she’ll spend time with Sun Woo, especially as Seol Chan gets busier with his own music. He would love to tell Sun Woo to scram, but he can’t, because they were once friends. If Sun Woo was a guy he didn’t know it would be differne,t but he knows all about Sun Woo. And truth be told, Seol Chan doesn’t hate Sun Woo. Se Yi asks what exactly happened between them? Seol Chan was adopted and it’s a secret he only told Sun Woo. One day Sun Woo was worried about Seol Chan so he told his own mother, who called Seol Chan’s adoptive mother. 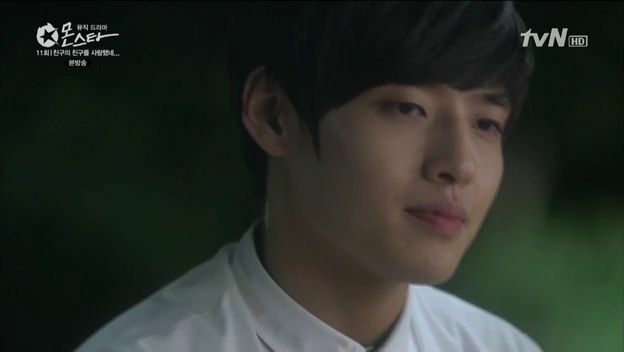 Seol Chan was upset that Sun Woo betrayed his confidence, and that the call ended up worrying his adoptive mother. And Seol Chan never wanted to worry her because he doesn’t want to be seen as a burden. Se Yi goes home and looks at a picture on her phone of Sun Woo and Seol Chan playing the piano together. She thinks back to how wonderfully Sun Woo and Seol Chan played the duet. She calls up Sun Woo and asks him out on a movie date. 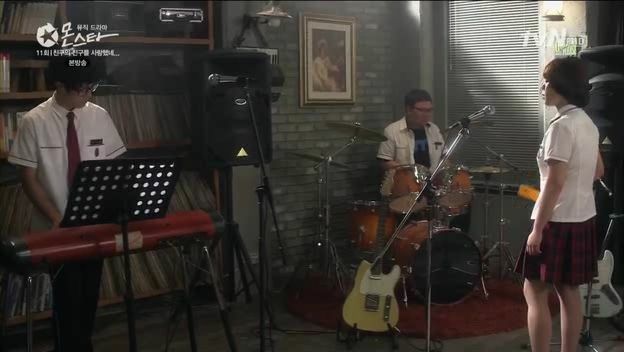 Na Na is at the basement studio and is asked to sing as Do Nam starts playing the drums. Se Yi and Sun Woo re-enact her date with Seol Chan but this time it’s Se Yi who taps Sun Woo on the arm and smiles at him outside the movie studio. They eat some food and then head into the movies. Se Yi is very happy. Afterwards Sun Woo walks Se Yi home and she tells him that she had fun today. He murmurs an understanding and she points out that he always murmurs rather than reply with the same sentiment out loud. Se Yi thanks him for being someone who listen to others and turns around to tell him that she likes Seol Chan. She asks if he can murmur his understanding to this as well? Sun Woo looks totally morose. Sheep girl, you know I adore you, but wouldn’t this confession be more appropriately served to Seol Chan first?!?! Hello? I know you don’t want to make things worse between those two guys but you’re not helping by taking THIS long to tell Sun Woo you don’t like him like that. 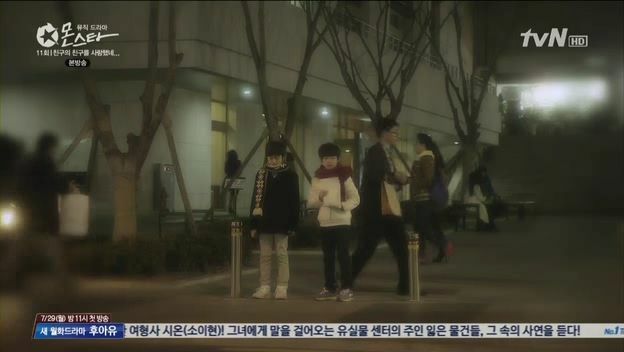 Na Na starts to sing and the sad song plays over Se Yi and Sun Woo standing there on the street. Se Yi turns to leave but Sun Woo calls her name and she turns back to him. They stand there staring at each other. Wow! 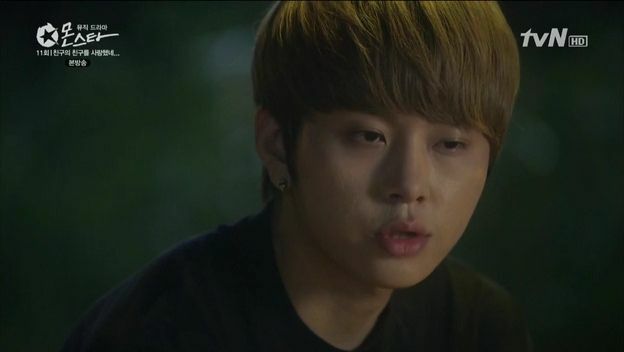 You’re quick with monstar’s recaps. Honestly, I have a little hope if Se Yi & Sun Woo will end up together. I’m hoping Kim Na Na bought the shirt for Park Kyu Dong!! This was roughly how the clothing store “date” went..
SW: Are you buying me a shirt? You dont need to. NN: Its not for you but for the ahjusshi (at the room saloon) who thought me how to play bass. SW: You should give him something you made, then. NN: I tried to but he kept refusing it. He said he will turn it into rags if I keep insisting in giving it to him. NN: It looks good. We’ll take it (to the saleslady). SW: Ahjusshi is the same size as me? Thanks Ms Koala for recapping. I love the pace of this ep, though no cute OTP moments but many questions answered, its like the PD and writer is taking their own sweet time to tell a story and we viewers just need to sit and wait patiently. Thank you for posting the recap so quickly! thks a million … you are the best captainK!!! I still love the eps … It’s nice of Se Yi to give her final sweet memory to Seon Woo and remind him again whr he stands in this relationship. I’m expecting lots n lots of fluff from SeolYi next week … pleaseeeeee …. i do! haha. mostly because i’m a seonyi shipper. but they’d actually be cute togeter. like in the soccer scene… it had all my favorite couples- kyunam, seonyi, seolna…..
Am I the only one that thinks the scene between Joon Hee and Se Yi had some chemistry. But nothing beats Se Yi and Seol Chan!!!! I thought the air sizzled a little with Se Yo and Joon Hee!! There was some chemistry there! You’re not the only one. It sizzled so much. I thought I was going crazy. Still I will ship my babies Sol Chan and Se Yi to the end. Nope, me too! I loved how the school prez showed a little interest in sheep girl, even doing her the great honor of allowing her to call him by name, *snerk*, only to be shut down cold! He then reacted as only a true egomaniac can, by getting royally pissed that she didn’t appreciate his magnanimous gesture. His sister is only slightly better in that she doesn’t pretend to be anything but a snob of the highest order. Not that it’s anything to praise her for. It’s pretty bad when even JR is embarrassed by your behavior! I totally agree! I hope they can build on more episodes with that! Even in the beginning I thought Joon Hee was going to be involved with Se Yi somehow?? well just like you said judging with how he still acts around his adoptive mother, like she’s this stranger that he owes a debt to, I can buy that he’s held a grudge like that for so long. Sunwoo is the only other person he told about a very private matter and even if it was his mother, he still told someone else. Seol chan already feels like an outsider in his own home, it really all comes down to Seol chan and his trust in people around him. It wasn’t really a huge revelation or something big plot wise, but personally it was just a nice reveal of his character. I think seol chan’s back Story isn’t disappointing. This breach of trust really hurt him a lot. The only Person who knew that he got adopted was Sun woo and it was a secret between them. It still hurts seol Chan that his Real parents abandoned him and he didn’t want to trouble his adoptive parents maybe out of fear they would leave him too. So don’t take his issue lightly. I think I’m one of the few not bothered by the pace of this episode. With this writer I kind of expected some things to be left to the final episode, so maybe my expectations were different going in. I have never been interested in the parent love triangle except for how it impacted and paralleled the kids, but I have to say that the scene in the park between SY’s parents left me teary-eyed. I also think this episode helped me understand why the SW-SY-SC triangle has gone on as long as it has. Because of her own situation SY’s heart is softening towards her mom and she’s able to understand and maybe even empathize with her, setting the stage for their reconciliation. I agree with your take on the SW-SY-SC love triangle. I think it’s really necessary to drag this issue in order to resolve other things, such as SY’s reconciliation with her mom, SC’s issue to whatever he and SW had in the past, and other more things involving the three. It’s like there’s an invisible knot that connects the different strings of their issue. Ande when all is resolve it’s like the knot is gone and the strings are finally free. So yeah.. I kinda expect a lot in this ep but this much will do. But if there are more scenes between SC n SY it wouldve been better coz I like them soo much. I never really like SW so I dont want him to be with either SY or NN. NN happen to be too good for him. N his one sided love for SY is a little bit too much despite knowing dat she likes SC. 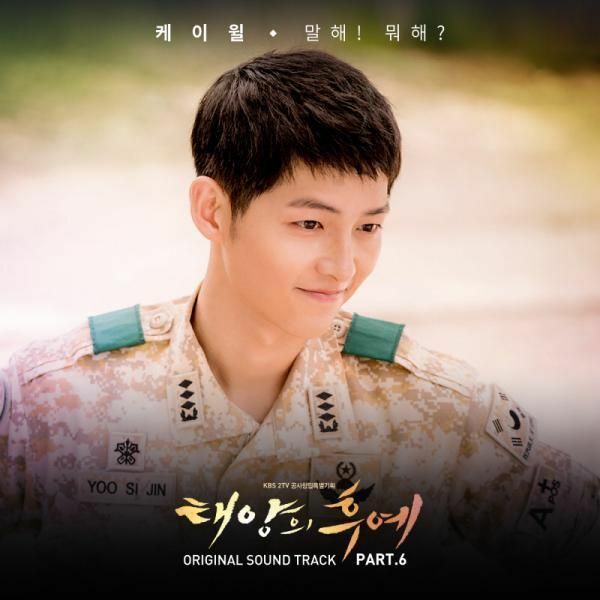 Here’s some of the songs from the drama which are not part of the OST. I really like a lot of the music that they have on Monstar, so I decided to try my hand at splicing and editing some of the music to sound more like a complete song. There are still some artifacts in there as unfortunately, I didn’t have access to the original sound tracks. Hopefully, people enjoy them as much as I do. For some reason you have to load the mp3s twice on 4shared. I’m not really sure why. They left the best songs out of the soundtrack! I wish I can find a clip of Seyi’s dad singing to his mom. I love his voice. Thank you for the recap. Koala, you’re sooooo kind. The pace of this particular episode was a bit slow.I hate it that they dragged out the love triangle for so long.Seyi should have come clean about how she views sunwoo as a friend and nothing more way back, so that by this episode sunwoo would have atleast seen nana in a new light.I think the sunwoo-seolchan fallout reason is a pretty good one,imagine your best friend betrays you and spreads the secret even if he tells it only to his mother,frankly speaking even I would have held on to the grudge because at that age you believe that everything is bright and gay and nothing can go wrong,when such things happen they leave a very deep mark. Who plays little Hae Rim? At last she made a choice. poor SW, but if only she told him sooner. i thought it was kinda mean to ask him out on a date then, break his heart at the end of the date. i was hoping for more SW & NN. they have so much heat. I just hope the have a good ending. im shipping the so much. Am i the only one who loved seol han singing that song falling in love with a friend’s friend? I love the song and i loved his rendition of it. Like some here, i have no problem with the pace or the story thus far. The song choices and how they have been woven into the stories in the drama really enhancethe emotional content of the show. I’m really hoping for an extension of episodes!! Like this isn’t going to be enough to fit into one final one. An I the only on interested in the School President, and him possibly being romantically interested in Se Yi?? This could become a whole new awesome storyline to cover up the sad over dragged one from earlier. I live for love triangles lol. and I’m so disappointed in the fight over Se Yi, it’s like nothing happened but something did? wow, that mini scene with joonhee and seyi. it was only for a minute but man, i felt the chemistry. and wow, hyorin is just a whole new level of nasty. you know you’re terrible when even jaerok is appalled by your behavior.